One of the most important questions at the start of building this organ: Is the sound right, are the scales right? The answer proved even more difficult when the organ was not in playing condition. So it was a matter of the organ builder’s judgement and experience. 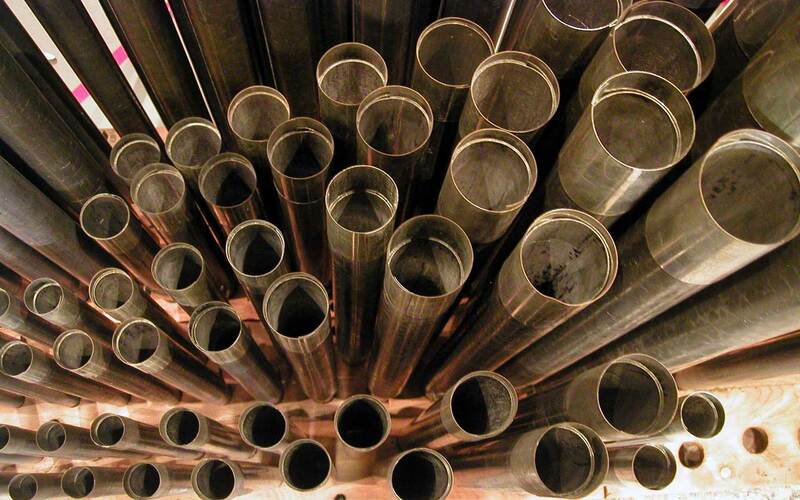 For days on end, the pipes, which Andreas Ladach still had stored, were measured, examined and eyed critically. The result not only fulfilled all expectations, but also raised curiosity about the sound..
Broad primary principal choruses give the note (the “narrower” open diapason No. 2 8’ in the Great still has a diameter of 147 mm! ), even in the Choir. Even though the double open diapason 16’ has a broad bass, the treble sounds more like the strings, which has an advantageous effect on the full organ and gives it a solid bass foundation that is not spread too thick in the middle and upper layers. Several 2’-stops and not too highly laid compound stops give the organ a lovely crest sound. Most of the flutes are harmonic. The spectrum of intonations becomes especially apparent with the flute stops. Although the “Harmonic flute 4’” in the Great and the Choir have been scaled identically, their lips have different shapes. So both stops have distinctly different characteristics despite having the same scale. High expectations were set from all sides and during the building phase, the news of the „English Organ“ project had already spread quickly throughout expert circles. Ultimately, these expectations were at the very least fulfilled if not greatly exceeded because the Limpericher organ definitely produces a sound that is, within our scope and in this form, surely unique. The very emotional inaugeration concert was performed by Prof. Geffert, who was predestined for it due to his knowledge of English instruments. It was a very special type of musical experience for the guests and left many impressions and memories. But once again as it is the case so often, words simply fail to describe what had to be experienced!